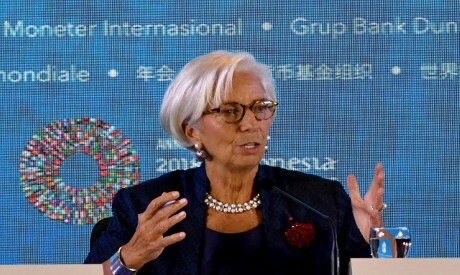 International Monetary Fund Managing Director Christine Lagarde on Thursday warned countries against engaging in trade and currency wars that hurt global growth and imperil "innocent bystanders." The tariffs stem from the Trump administration's demands that China make sweeping changes to its intellectual property practices, rein in high-technology industrial subsidies, open its markets to more foreign competition and take steps to cut a $375 billion US goods trade surplus. "We certainly hope we don't move in either direction of a trade war or a currency war. It will be detrimental on both accounts for all participants," Lagarde told a news conference. "And there would also be lots of innocent bystanders," including countries that supply commodities and components to China, such as Indonesia. In recent weeks, US Treasury officials have expressed concerns about China's weakened yuan as the department prepares its semi-annual report on currency manipulation. US President Donald Trump has accused China of deliberately manipulating its currency to gain a trade advantage, claims Beijing has consistently rejected. Yi, in a closed door meeting on Thursday with investment officials, explained that China's monetary policy was on an opposite rate cycle to that of the United States, which is tightening monetary policy due to a strong economy, two people who attended the meeting said. Over the weekend, the PBOC cut bank reserve requirement ratios for a fourth time this year to ease credit conditions and support businesses, including exporters hit by the US trade war. The PBOC did not immediately respond to Reuters’ request for comment on Yi's remarks. Lagarde weighed into the currency debate on Thursday and appeared to side with China, saying that yuan weakness against the dollar was driven by the greenback's strength as the US Federal Reserve hikes interest rates. Against a basket of currencies, the yuan has depreciated less. "We have supported the move of China towards (currency) flexibility and we want to encourage the authorities to continue on this path," she said. World Bank President Jim Yong Kim also warned against an escalation of the trade row, saying that if all countries maxed out their trade threats, "We’d see a clear slowdown in the economy and the impact on developing countries would be great. We're working with every single one of our countries to prepare them in case it gets worse." The IMF and Pakistan on Thursday launched talks on a new bailout program aimed at easing a mounting balance of payments crisis in the South Asian country. It would be Pakistan's 13th IMF financing program since 1988.